Ryokia is a fifteen year old girl who attends Gin Private Girls Academy. She has short black hair and brown eyes. She's quiet some of the times and can be downright serious when she wants, but with her friends she's open and funny and very colorful and bright. Her boyfriend is Chikatsu Tora and they've been going together for two years now and are very close. She is determined and passive as Cronus. Ryokia says this to transform into Sailorcronus. She raises her henshin stick (which is dark blue with a purple star) and her sign glows on her forehead, a dark blue beam convenges on her and she's in her fuku after a flash of bright light, striking her pose. This is Sailorcronus' only attack. Crossing her arms over her chest like a butterfly, she flaps them slightly. The flapping creates a dark purple ribbon that extends and then wraps around the enemy, chocking/wrapping them up. Ryokia OR Sailorcronus says this to transform into Super Sailorcronus. Same transformation as before, but with arm shields. This is Super Sailorcronus' only attack. Humming a soft tune, the sound begins to echo and the echos create a purple haze, which vibrates within the ears of the target. Ryokia OR Super Sailorcronus says this to transform into Eternal Sailorcronus. Same transformation as before, but with guarded arm shields and a longer back bow. This is Eternal Sailorcronus' defensive attack. Saying this, purple vines shoot up from the ground, wrapping themselves tightly around the target, trapping and suffocating them. This is Eternal Sailorcronus' offensive attack. 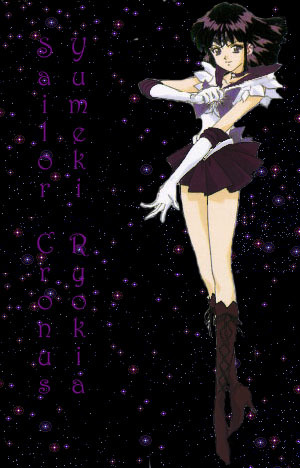 Touching her tiara, a purple mist fills the air, freezing the targets and sending encouragment through the Senshi (both Sailor and Greek).